Dr. Dolly graduated from the National University in Galway with BSc and MSc degrees in Biochemistry, and won a postgraduate award that allowed him to obtain a PhD under the guidance of the renowned Professor Kenneth Dodgson, Secretary General of the Biochemical Society at that time. Strong publications and recommendations enabled him to obtain a post-doctoral position in the internationally recognized group of Professor Eric Barnard, FRS at the State University of New York in Buffalo. Working with this pioneering Neuroscientist on a campus where Sir John Eccles, a Nobel Laureate, was promoting research on the nervous system fostered a career in the emerging discipline of Molecular Neurobiology. An in-depth and advanced training in the biochemistry of membrane proteins helped him to pioneer the purification and biochemical characterization of the acetylcholine receptor from muscle. Accordingly, he won a prestigious scholarship from the Muscular Dystrophy Association of America that funded work on elucidating the oligomeric and subunit structures of that essential protein. On being offered a faculty position in the University of Maryland, Dr. Dolly embarked on a new project on neuronal cation channels with a grant from the National Science Foundation. Meanwhile, this progressive researcher was head-hunted by the renowned Imperial College for the Neurobiology faculty. There he launched programs to decipher a molecular basis for the fundamental process of quantal release of neurotransmitters and its modulation by K+ channels. Over 27 years, he built a very progressive and productive team that acquired a worldwide reputation through numerous publications in high impact journals, as well as invited lectures at international conferences. Parts of the research involved collaborations with leading groups at CNRS, France; School of Pharmacy, London; University of Wisconsin; University of California at Davis; Institute fur Neurale Signalverarbeitung, Hamburg, as well as industrial sponsors (Allergan Inc., Irvine, and US government institutes). 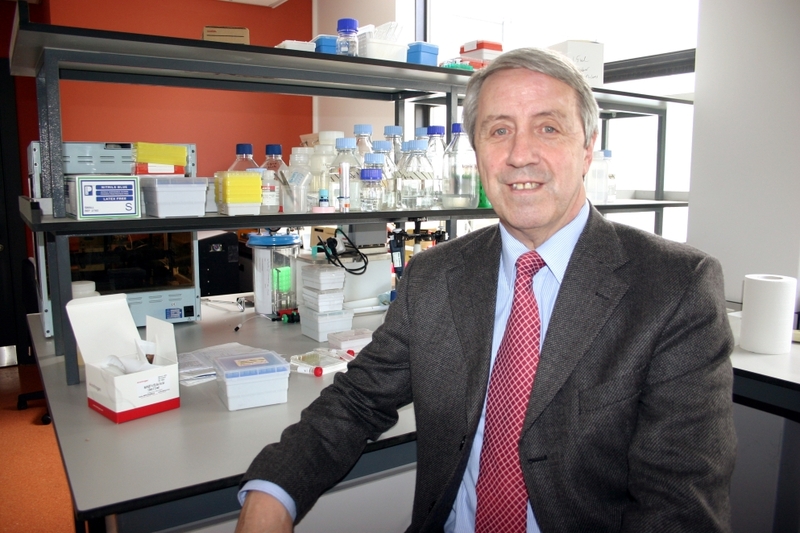 Reaching the second highest position for securing competitive funding in the Imperial College consortium and commendable research accomplishments earned him promotion to Professorship in 1989. Likewise, the University of London recognized these meritorious achievements with the award of a DSc in 2002. The launch of substantial funding programs by Science Foundation Ireland provided an opportunity for a return to Ireland. An application submitted with Dublin City University as host resulted in the prestigious award of one of the first Research Professorships, after top class reviews by overseas experts. This key funding was supplemented with large research contacts from overseas sponsors, which financed the creation of ICNT. Such a major initiative was launched in 2003 to develop novel treatments for certain neuronal diseases, based on deciphering molecular bases of abnormalities in synaptic transmission. The first-rate multidisciplinary investigations ongoing therein have exploited data obtained from basic research to engineer second-generation candidates to improve a marketed drug. Moreover, novel therapeutics are being designed to normalize the abnormal activity of certain nerve endings in a number of diseased states. Dr. Dolly’s world class status as an extremely creative/industrious researcher (176 peer reviewed articles with 7,807 citations), and applaudable achievements in Ireland, have been recognized by award of the Conway Research Medal by the Royal Academy of Medicine Ireland, President of DCU Award for Research, and election as a member of the Royal Irish Academy.